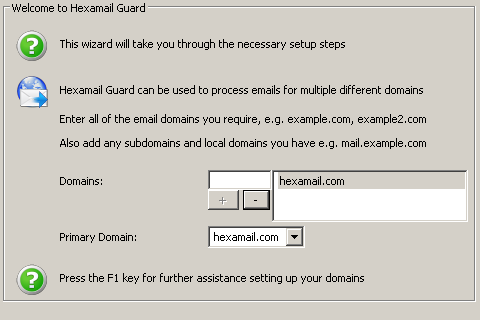 Hexamail Guard then needs to know which email are incoming and which are outgoing (as it can process both inbound and outbound email traffic). It does this using a set of domains that are considered 'internal', i.e. your domains. You may only have one domain, e.g. @example.com, or you may have multiple, e.g. @mail.example.com, @us.example.com, AND @example.com. Then setup the list of administrators who require notifications and alerts.